A champion athlete Galina Bukharina is currently chiselling India's relay squads. The 73-year-old Russian ensures that when it comes to discipline and a strong work ethic, she gives no quarter to the quarter-milers. Even before the Russian-American coach Galina Bukharina was introduced to her quarter-mile trainees at the national camp in Patiala, she knew how to break the ice, or to convey a very clear message. The brief introduction left the athletes a bit dazed, but the 73-year-old knew exactly what she was doing. “On the very first day, I said, ‘listen, guys, I know that this is a democratic country but I want to tell you at the very first step that for coaching under me it’s only dictatorship. Only dictatorship,’” said Galina with a heavy Russian accent and a straight face. It’s been just 15 months since she took up one of Indian athletics’ most high-profile jobs, primarily because it deals with managing the relay squads, she has helped India bag seven international medals including a Junior Worlds medal. The Jakarta Asian Games, which was to be her first major test, Galina’s wards returned with a rich haul of six medals (five silvers and a gold). But when Galina arrived last summer to take over the quarter mile national camp after a 20-year stint in the US, all this seemed a far-fetched dream. Reason? She did not have anyone to coach. “For the first two months, no one arrived. I mailed Adille Sumariwalla (Athletics Federation of India president) that I am going back home because I have no one to coach. I was patient and deputy chief coach Radhakrishnan Nair brought in a lot of young people. I told the guys, ‘you have an advantage over the other athletes’”. “I am not ashamed of telling anyone that I am good and I have proved that,” said Galina.With a little nudge from the Federation and some convincing by Galina, the athletes came trickling in but it was still difficult to convince the seasoned athletes. She had to wait till the Commonwealth Games for India’s fastest quarter-miler Muhammed Anas. Now, Galina says, the differences between her and the big athlete have been ironed out. “I think they understood. They felt I have a different approach from their coaches. I have seen a lot of Anas’s coach (P. B. Jaikumar) and to tell you the truth, his methods are outdated. I asked Jaikumar during time trials in January to join us. He told me yes, but three days later, he told my assistant that he’s not coming. But eventually, Anas joined by himself,” Galina said. Galina isn’t someone who hesitates to call a spade a spade. When Hima joined her after winning India’s first Worlds medal at a track event, things didn’t start off on the right foot. Galina felt the attention that the Assamese prodigy received post her Worlds triumph went to her head. She saw that the teenager was hesitant to join the team practice and would arrive fashionably late. Late is a trigger word for Galina. She kept patient initially till she felt it was high time and finally put her foot down. “The first day, she came to practice 10 minutes late, the next day 20 minutes, and the third day she came one hour 10 minutes late. One hour 10 minutes ! She came up to me and asked ‘coach what should I do?’ I said, ‘I don’t know. My time is over and I am going’. My work was done and I went away. After 10 minutes she came to my room and apologised and I had enough time to recover her before the Asian Games. After that, she did not miss a single practice and was very obedient. These lessons, they have to be taught. They have to understand that we are doing our job,” Galina said. Galina feels the Dhing runner is immensely talented but she has a long, long way to go before she achieves star status. The moment Hima’s lackadaisical approach towards practice was sorted, she did more than impress the seasoned coach. Galina feels she has the ideal qualities of an athlete that a coach can mould. “She’s tough. But she didn’t understand her abilities completely, and me neither. After the first physical test I set for her, I saw that she has very good qualities. She is a winner inside and it doesn’t matter what she is doing, she wants to to be the best at it. In each exercise that she does she puts maximum effort,” Galina said. Galina Bukharina with her team in Czech Republic. I love everybody who works with me. I would not say they were the most disciplined. It took a lot of time for me to correct them but they responded. Assembling the squad at the national camp was just a minuscule part of the larger scheme. During the course of the interview, no word was uttered as often as discipline. The stereotype that “Indians never reach on time” was reaffirmed during the initial phase of her coaching stint. “I can’t stand it when people are late for practice,” she says in a stern tone. Galina strictly believes in practising what she preaches. For the interview, she gives a specific time slot and keeps a watchful eye on her wristwatch as she does a countdown of sorts. “ Oh, we have another 40 mins to go”. She sits upright, attentive, ready to tackle the questions. Interviews are rare because of her jam-packed schedule and her averseness to engage over the phone. She was also appalled at the lack of basic etiquettes among Indian athletes. But Galina drilled it into them. “The first time I came to the track at Patiala I was shocked it was untidy. Right now, my group they never throw any empty wrapper or something. They understand that it is our environment. We are here every day and we have to keep it as clean as possible,” she says with pride. Another thing that ticked off the strict coach was some players’ half-hearted approach towards training. Galina seems to have understood the Indian athletes’ psyche very well. It was time for her to act stern. “There have been two or three occasions where I have just stopped the practice because they’re standing and doing the exercise like this (makes a lazy gesture with her hand). I told everybody to go home. ‘I don’t need to see you practice like that. Do it with 100 per cent of your heart. Tomorrow, only those athletes who want to work hard can come, rest may go home,’” she said. Most of the athletes started responding but one: MP Jabir. Galina had not come across any athlete with a stronger willpower than him but felt his technique was faulty. Attempts to correct him were received positively initially. With just three months of practice, he went on to win a hurdles bronze at the 2017 Asian Athletics Championships. “He came up to my room around 12 am with his bronze medal and said, ‘coach here is the medal’. I told him this is your medal and you deserve it. After that when we resumed training in October, I was sure that he would trust me, but no. He kept coming up with excuses. I promised him he could make it to the 4×400 squad if he practised hard but he just disappeared and never showed up. What kind of muscles will you get if you only eat rice, rice and rice? I prefer them to eat meat but only a few people are eating that. I can’t change their habits and I understand that. It’s not just coaching issues that challenge Galina here. Food and Patiala’s summers are a cross she has learnt to bear. After spending over two decades in Austin, Texas she finds it very difficult to adjust to Indian food. “It’s not my food,” she says twitching her face. But Galina, who is a diabetic, is not very fussy and is happy as long as she gets her dose of milk, chicken and veggies. But she has a grouse with her wards: Most of them don’t eat meat. “I can’t change their habits and I understand that. Federation tries to help and educate them. They have been told many times to eat what you need for your sport (meat) and when you quit, you can eat whatever you like for the rest of your lives,’” she said. For the non-meat-eaters, protein supplements are prescribed. An athlete who has no qualms in consuming original protein is hurdler Dharun Ayyasamy. Galina saw Dharun’s potential long before it came to the fore in Jakarta. Dharun, the first man in India to run the 400m hurdles below the 49-second mark, is among her favourite wards. The 22-year-old had arrived with an injury to the camp and Galina not only facilitated his recovery but developed a special program for him to reach competition standards again. Apart from Dharun, who returned from Jakarta with hurdles silver, Poovamma is another athlete that Galina has helped in recovery. “He’s smart and he’s absolutely honest with me. If Dharun tells me, ‘coach, I need rest’, that means he really needs it. I trust him and he trusts me. Poovamma is the leader of the women’s group. She is very intelligent, honest and religious. All the girls feel that she’s very strong. She is always leading the group,” said Galina. 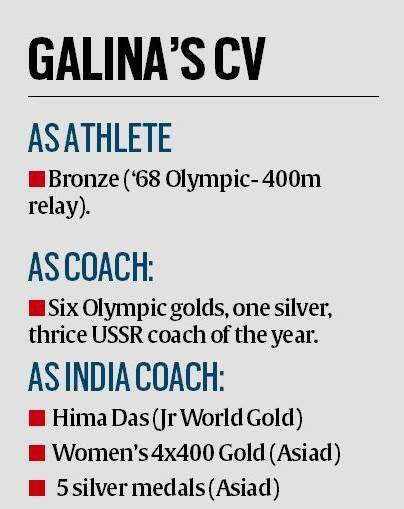 Roping in Galina was almost a coup by the Athletics Federation of India. Her reputation on the athletics circuit is larger than life. The former Soviet Union national coach’s wards still hold the women’s 4×400 relay World Record of 3:15.17s set in Seoul way back in 1988. “There’s no reason why anyone in India should be unsatisfied with what she has delivered. People still ask me how did you manage to convince her to come to India. Such is her reputation,” AFI president, Adile Adille Sumariwalla said. I was just 14 and told my mum that I want to compete in the Olympics and she laughed and then she cried. Galina developed a liking for athletics as a teenager back home in Voronezh. A book on a famous hurdler, whose name she feels is irrelevant now, inspired her to run. She was raised by a single mum who worked two jobs to make ends meet. The then 14-year-old would wait for her mother to arrive after work so she could go out and train in the streets. “I was little and scared to go out alone. I would practice sometimes at 11 pm.” The next year she joined a vocational school, primarily because her mother couldn’t afford to send her to high school. “I was at a big plant involved with aluminium production and there was a physical educatoin teacher who I began to run with. At 18, I won the national Russian championship and in 1964 I came back with silvers in 100 and 200m at the Junior Euro Championship in Poland. Everything I did, I did by myself,” a nostalgic Galina said. It is still early days for Galina here. But in the short time she’s been here, the 73-year-old has shown she means business. Her jam-packed schedule and devotion to her kids have kept her confined to the NIS Patiala campus. She is not complaining though as long as she gets to watch Animal Planet on the internet during her leisure time. Galina’s happy, but like most stubborn coaches, she’s not content. She is a woman with a plan and feels there’s a lot she has to change in the Indian quarter mile camp. For now, she’s taken one huge step: uniting the squad. “The group is very united now. Now that we are united, I tell kids that if they like each other, if they like to practice together, they have to fight for it. ‘I can’t put you on the list just because I am your coach. You have to show that you’re the best in India at the moment’ and they are doing this,” she said.